Lacrosse is a team game in which a ball is passed between teammates using a stick with a mesh or net at one end. It originates in Native American communities where it was used as a training ground for tribal warriors and dates back almost a thousand years. You might remember a friendly game of lacrosse taking place in the film ‘The Last of the Mohicans’ in which Daniel Day Lewis stars, and in its early form there were sometimes thousands of players on either side battling for victory. Since early versions of the game were witnessed and documented by French Jesuit missionaries it gained popularity and was first codified in Canada in 1867. The modern game is a fast, frenetic contact sport that requires players to wear padding and helmets – a sight at which no doubt the Mohicans would have laughed heartily. Here we will focus on field lacrosse (as opposed to the less common variations of box lacrosse and intercrosse). The object of the game is similar to many team sports involving a ball, namely to shoot said ball into the opponent’s goal more times than they do to yours. The lacrosse stick (or “crosse”) can be used to catch, carry and pass the ball with the intention of stopping your opponents gaining possession. When the opposing side have the ball the defending team can attempt to dispossess them using their sticks (against opponents’ sticks) or bodies. Each team consists of ten players: one goalkeeper, three defenders, three midfielders and three attackers. The lacrosse sticks are split between “short” and “long” sticks. The former must measure between 40 and 42 inches and the latter between 52 and 72 inches in length, the head of which must be no less than six inches and no more than 10 inches at its widest point. The goalkeeper’s stick may be anything between 40 and 72 inches in length and up to 15 inches in width. No more than four players are permitted to carry a long stick (excluding the goalkeeper). The ball is made of solid rubber and measures around eight inches in diameter. Hence helmets are required to be worn, while mouthpieces, shoulder pads, arm pads and gloves are recommended. To score a goal a team must propel the ball from their lacrosse stick into the goal such that it fully crosses the goal line. Infringements – such as a player entering the “crease” before the ball has crossed the goal line – will result in the goal being disallowed. The winning team is simply the one that has scored the most goals within the timeframe of the game. If scores are level after the game time is up, an additional period of Sudden Victory Overtime may ensue in which the first team to score a goal becomes the overall winner. 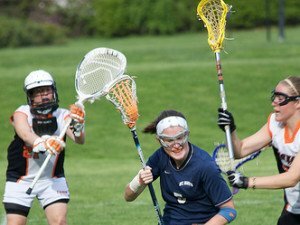 Lacrosse is played on a field measuring 110 yards in length by 60 yards in width, with goals at either end measuring six feet by six feet. The goal is surrounded by a circular “crease” with a diameter of 18 feet. A player may not score from within said crease. The pitch is dissected by the midfield line. The game duration is split into four quarters, each of 20 minutes. Team time-outs may be called by either side, during which the game time will be paused. Each player carries a stick or “crosse”, with up to four carrying a long stick (52-72 inches) and the rest carrying a short stick (40-42 inches). Players who make infringements – such as being offside or holding an opponent – are punished by being sent to the penalty box for a period of time, usually 30 seconds or one minute. Games are started (and restarted after stoppages for goals and at the start of each quarter) with a face-off. During a face-off a player from each side lays their stick horizontally next to the ball until the official blows their whistle, at which point the players battle for possession of the ball. Once a team gains possession of the ball they must ensure the ball is progressed beyond the midfield line within 20 seconds to encourage a fast-flowing game.